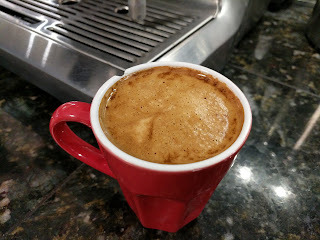 I noticed that one of the more popular espresso beans that visitors to espressocoffeesnobs.com were ordering from Amazon was Kicking Horse Coffee "Cliff Hanger Espresso" beans so I thought I'd order some for myself and put them to the usual test. Kicking Horse Coffee "Cliff Hanger Espresso"
The beans come in a 2.2lb / 1kg package. 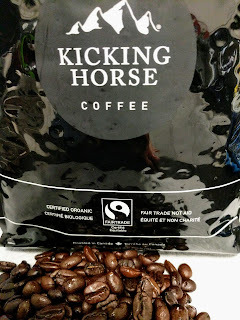 I was surprised to see when I got them that Kicking Horse Coffee roasters are actually based in British Columbia, Canada. Who knew that Canada had coffee roasters. Just kidding! 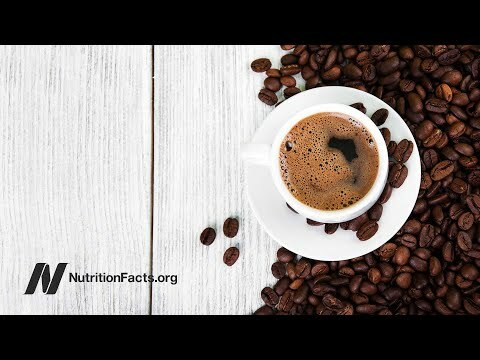 On top of that, the beans are both fair trade and certified organic! The beans currently retail at Amazon for $29.42 for the 2.2lb bag ($13.37 per lb or $0.84 per oz). I actually purchased the beans through the Amazon Subscribe and Save program and after the 15% discount paid $25 for the order ($11.37 per pound or $0.71 per oz). Not a bad price. The first thing I noticed when I opened the bag is that the beans were definitely a darker roast than I typically use. Because of the longer roasting, the beans were also shiny and wet-looking from the extrusion of the oils caused by the longer roasting. I was a little concerned about this as dark-roasted oily beans can result in less crema production when extracting an espresso shot. However, as you can see from the below video, ample crema was generated during the extraction of my test shot and there was no burned flavor. Speaking of which, as to flavor, my first impression was actually that it was kind of "woody". I know it sounds weird, but I don't mean it in a negative way; it's just the first thing that came to mind. And it's not that I've eaten a lot of wood in my life. :-) The balance of bitterness and sweetness was good, with no overpowering or lingering bitter or sour aftertaste. When I used the beans to make a flat-white, the flavor had the oomph to support itself and not be overwhelmed by the addition of milk. I'm glad I didn't write this review immediately since you can see there were a couple of first impressions that left me wondering. At this point I'm almost through the entire bag of beans and in the next few days will take delivery of my Subscribe and Save order . I love these beans! Having made coffee with these beans every day for a month now I have fallen for these beans, so I wholeheartedly recommend them to you. Buy some Kicking Horse Coffee "Cliff Hanger Espresso Beans" and see for yourself. See all my espresso bean coffee reviews. I have the same grinder and machine and was wondering on what you grinders settings were? amount and grind number. Hi Jamie. I use a Breville Smart Grinder. I have the grind indicator lined up with the "p" in Espresso. I have it set for a double shot, and the "more/less" is 3 marks to the left of center.